Nicknamed the heart of America, Kansas - bang in the middle of the USA&apos;s Great Plains - is known for being home to Dorothy in the Wizard of Oz. Kansas is best known for its unique style of barbecue cookery. Meat is cooked slowly in large smoke pits and, when served up to hungry customers, covered in all manner of delicious barbecue sauces. We check out the 10 best BBQ joints in Kansas. Kitted out like an old-school American diner, the Wyandot Barbeque in Kansas City specializes in huge slabs of ribs and pork, as well as whole smoked barbecue chickens. Dark wooden benches and booth tables set the scene for social dinners, where large groups can crowd round and chow down on the very finest in barbecued meat and sides. Guests can choose between all manner of combination plates, with pork, beef brisket and turkey all available. Sides include delicious and giant portions of French fries, onion rings and dill pickles, as well as hot and spicy jalapeno peppers, and bowls of chili. Gates & Sons Bar-B-Q is a small chain of barbecue restaurants, local to the state of Kansas. The original restaurant was first opened in 1946, while five further venues have been slowly added over the last 60 years. Gates & Sons are famed for their barbecue sauce, which harks back to the original family recipe. The sauce can now be found smothering delicious menu items including pulled pork; sliced beef; and sliced turkey; as well as slabs of ribs, rings of sausages, and mixed plates of all meats. 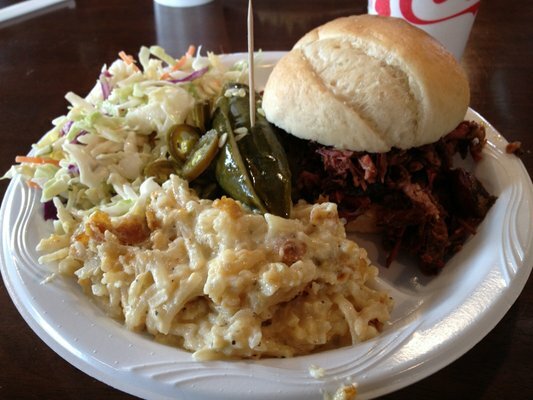 Traditional barbecue sides prevail, with cole slaw, potato salad and barbecue beans all available. Jack Stack Barbecue in Kansas City serves barbecue food as beautiful as the restaurant is decorated. Large oak tables fill the dining room, and provide ample seating for large groups of friends and family. The large indoor smoker - fuelled with hickory wood chips - allows Jack Stack Barbecue to produce a large daily quote of freshly barbecued and smoked meats. Like all barbecue restaurants, Jack Stack serves a great selection of different meats, prepared in a variety of ways. Chopped, sliced or pulled, options of pork belly and beef brisket are carefully marinated before being slowly cooked in their own juices. Unlike more typical barbecue options found in Kansas, Brobecks specializes in a dry rub barbecue technique. Instead of marinating meat in a sauce before cooking the cuts of pork, beef and chicken are coated in a dry rub. These are then slow cooked in a broiler, and served without sauce. However, Brobecks certainly know their audience and allow guests to add their own sauce if they can&apos;t bear to eat without it. Sandwich options include the smoky Joe, where barbecued meats are chopped and coated in sauce and served in a bread roll. Texas toothpicks - unique starters of deep fried jalapeño and onion - are a great way to kick off proceedings. Woodyard BBQ is a reincarnation of the much older Southside Patio and Wood, a restaurant that was first opened in 1913 by Frank Schloegel. Now known as the Woodyard, this restaurant has always been well regarded for the variety of wood chips that it uses, which include cherry, apple, and hickory oak. Specialty menu items include chilli con carne, topped with burnt ends, the cuttings from the pointed half of a smoked brisket, and also maple smoked salmon. Other menu items include barbecue classics such as baby back ribs, covered in delicious barbecue sauce, and a bacon and pickle cheeseburger. Bite me BBQ in Wichita is a family owned and operated restaurant, specialising in home cooked barbecue dishes. The owners make sure they work on site every day, to ensure the high quality and standards of all food sent out to customers. In fact, the food is so good, Bite me BBQ was crowned the best ribs restaurant in the whole of Kansas. Main dishes include spare ribs, slow cooked for 16 hours; 18 hour smoked brisket, sliced to order; and hand prepared pulled pork. Bite me BBQ also prepares a selection of Mexican inspired barbecue dishes, including the delicious spare rib meat chimichanga. Grover&apos;s Smokehouse and BBQ has been preparing, smoking and barbecuing delicious cuts of meat for the last 40 years. 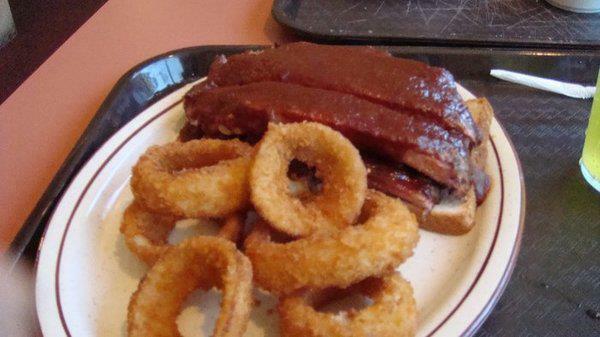 As with most Kansas based barbecue houses, Grover&apos;s Smokehouse focuses largely on marinating and slow cooking meat, before serving with the restaurant&apos;s home made barbecue sauce. Guests can choose between one variety of meat, or a combination plate of all offerings. Grover&apos;s main specialty is, however, pork ribs. Diners can choose between individual spare ribs - huge hunks of freshly hewn meat - or racks of baby back ribs, which come served with the obligatory fries and barbecue beans. NOTE: Grover&apos;s is now closed. In Kansas City - either in Kansas or Missouri - barbecue is a hotly contested subject. Joe&apos;s Kansas City Bar-B-Que (which is in KCK, in Kansas State) is perhaps one of the most popular barbecue restaurants around. Operating out of an old gas station (that&apos;s petrol station for my fellow Brits), Joe&apos;s is the brainchild of Jeff and Joy Stehney, who embarked upon the restaurant industry after success on the barbecue competition circuit. With a more varied menu than many of its contemporaries, Joe&apos;s features dishes such as pulled chicken breast sandwich, and a Carolina pork offering. Sides - including ‘dirty&apos; rice and beans - make for a nice change of pace. While most of the restaurants in this list focus solely on the food, Prairie Rose Chuckwagon Supper is a lively mix of all you can eat, music and entertainment. On show nights, the Prairie Rose Opera house opens its gates at five o&apos;clock, allowing guests to take in the beautiful ranch sites, with horse drawn carts and cowboy movies to be enjoyed as well. At dinner, visitors can enjoy an incredible al you can eat dinner - including smoked brisket and sausage - as well as all manner of delicious sides. While the food is rolled out, the team at Prairie Rose put on an unforgettable show that will surely transport diners back to the old west. Not much is known about Lonnie Q&apos;s BBQ - it is almost completely lacking of any online presence, bar it&apos;s google plus page. However, based on a range of reviews from a wide selection of web-based sources, Lonnie Q&apos;s is the place to eat should you find yourself in Topeka. Guests can pick between pulled pork, beef brisket and smoked turkey or, you know, pig out on all three. As typical of most Kansas based barbecue recipes, all of Lonnie Q&apos;s delectable meats come with a sweet and tangy barbecue sauce that is both darker and richer than other varieties found in the rest of the USA.